Smile! Usually I cannot stop smiling when I am painting. My happy place which eliminates the need for a bucket list. I am so grateful for the fun and challenges that paint and a clean canvas offer me. Heather completed a Fine Art Degree at the Univercity of Stellenbosch, many moons ago! Having working in Publishing for 10 years, she opened her own advertising business with thrived on deadlines and 'not enough hours in the day'. Deciding to take her time back, she has committed to painting as a career. Lots of experimenting, play and happy accidents. 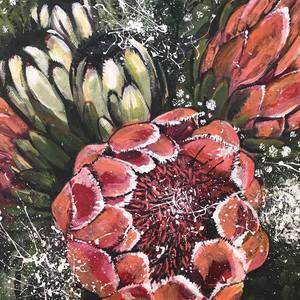 I have an exhibition at Chardonnay Deli, Constantia, South Africa, in March 2019.